1. First, cover your work area with a drop cloth so that any excess dust that falls doesn’t cover your floor. 2. Turn off the power to your fan by switching it off in your circuit breaker box. Then, carefully remove the old fan cover. 3. Remove the motor and unscrew the mounting screws. Then, disconnect the fan wiring from the house wiring. 4. After that, locate the exhaust vent hose (which may be in your attic) and disconnect it. 5. If the vent is attached to any joists or trusses, unscrew it. 6. If your new bathroom fan is larger than your old one, measure the fan’s dimensions and cut your ceiling drywall to accommodate the new fan’s housing. 7. Secure your new bathroom fan to the joists or trusses, then reattach the exhaust vent hose. 8. Reconnect the fan wiring to the house wiring. Then, install the motor and blower assembly and screw into place. 9. Install the new fan cover, but don’t secure it just yet. Turn the power back on to your fan and turn it on. 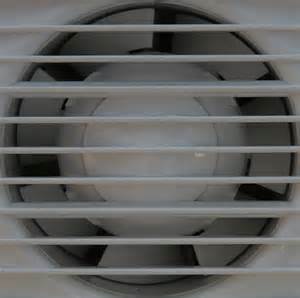 If it sounds ok, turn it off, then secure the fan cover and screw into place. If it’s loud or rattles, you may not have installed it securely or level. Make adjustments as needed, then secure the fan cover and screw into place.